In late June, I came up with the idea of loading the 12 Minute Tips that I write each week, into one, easy to use e-book. I shared this idea with my team at Weaving Influence to see if they thought I was crazy, but their support was overwhelming, and 31 Days of Twitter Tips started to take shape. The process of going from blog posts and ideas to a completed e-book happened in less than a month, and I could not be sharing it with you today without the help of the entire team at Weaving Influence. Special thanks to Carrie, who edited every version of the book that I sent her. Because of Margy’s hard work, we’ll be able to offer 31 Days of Twitter Tips on Amazon, starting September 1st (thanks, Margy!). And thanks to John, who spent many hours on the design and layout, making 31 Days look fantastic! I also want to give a shout out to some of the early reviewers of the e-book, including the team at Weaving Influence, and Bret Wortman for sharing his thoughts in a review of 31 Days of Twitter Tips. We made the decision to offer 31 Days as a free download on 12 Minute Media for the 31 days of August, and I’m excited about the response that we have received so far. Yesterday, 34 people downloaded advanced copies of the e-book, with more downloading today! My goal is to get the e-book into the hands of as many people as possible during the month of August. At the end of the book, I offer up a 31 Day Challenge to the reader: Try the ideas in the e-book, take the Challenge, and tweet about your experience. We’ve got a whole page of tweeting, blogging, and posting resources to make sharing during your 31 Days a very easy experience. 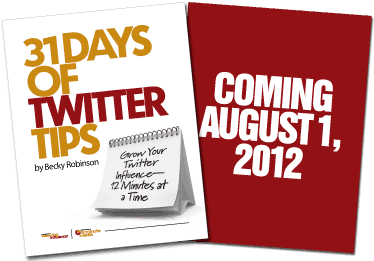 I personally have a goal of getting a free copy of 31 Days of Twitter Tips into the hands of 1,000 people over the next month, will you help me spread the word? Get started with the 31 Day Challenge. Mark it on your calendar. Share it with your friends. During the month of August, Promote the free download on Facebook, Twitter, LinkedIn, and Google+. Prepare to try one new tip each day – 12 minutes that have the potential to change the way you view Twitter. Tell me something! Do you plan on taking the 31 Day Challenge? What’s your favorite part of Twitter? Conversations? News gathering? Retweeting? Hi Becky. I was excited to learn about the challenge and plan to participate. I love Twitter. I learn about a lot of new things like your ebook, find great articles, connect with new people and love retweeting. Looking forward to learning some tips to help maximize my experience, minimize my time and develop more presence. From the first day I got on Twitter, I was pleasantly surprised at how quickly I gained followers and made great connections. What I like most is the people I’ve been able to meet, and the relationships I’ve built. I don’t understand why more people won’t at least give Twitter a try. Thank you for offering your new ebook for free. I think I’ll take on the challenge.